I’m not afraid to admit that, when it comes to multiplayer maps, I love a gimmick. Whether it’s the symmetrical towers of Facing Worlds or the bridge connecting the two bases in 2Fort, I always enjoy a map built around an idea like this. So this is perhaps the main reason why I love Twisted Steel, an enormous map featured in Battlefield V, so much. Set in war-torn France, this swampy expanse is dominated by an enormous bridge—part of which has dramatically collapsed. Below the bridge is a dense, marshy forest for skirmishing in, but it’s on the structure itself where the most exciting firefights inevitably take place, around the two capture points placed strategically at either end of it. When charismatic orlan pirate Serafen joins your crew in Deafire, he reveals the location of a pirate leader who you have a special interest in killing: a criminal hangout called Fort Deadlight. And it’s here where the game’s best quest takes place. If you’re feeling brave you can fight your way through the fort, but it’s much more fun to slip in undetected and blend in with the other pirates there. Talking to them reveals clues about your target’s routine, his weaknesses, and suddenly you’re playing a Hitman level. This is probably the smallest location on our list, but one of the richest and most powerfully immersive. As you explore this stricken merchant ship a storied past begins to emerge, painting a vivid picture of both everyday life, and the horrors that befell it. The fact that we see the mundane day-to-day activities of the crew makes the moments when tentacles start flailing, flintlocks start firing, and people start dying even more impactful. 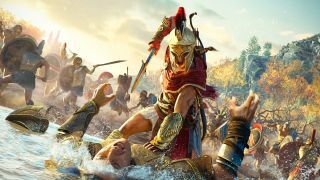 Although the settings in the Assassin’s Creed series have always been romanticised and exaggerated to a point, Odyssey is Ubisoft’s most dramatic and imaginative departure from historical accuracy yet. This is not the ancient Greece of the history books, but of myths and legends. It almost feels like a fantasy setting in places, with towering statues of the gods dominating the skyline and temples perched atop impossibly high mountains. One of which, in the Korinthia region, is the magnificent, colourful Temple of Aphrodite. Why were the Awoken slumming it on the Reef when they had this beautiful rainbow palace hidden away all along? Destiny 2: Forsaken’s endgame zone is designed to provide shifting challenges across a month. Secret dungeons move around week to week, and you can hop through dimensional portals to slip between two instances of the zone. The weird, brilliant Yakuza series has finally punched its way to PC, and this prequel features two beautiful, atmospheric slices of Japanese cities to explore: Kamurocho in Tokyo and Sotenbori in Osaka. Based on Kabukichō in Tokyo and Dotonbori in Osaka, both perfectly capture the feeling of being in a busy Japanese city, and the 1980s setting is brilliantly fleshed out with era-appropriate tech and fashion. From the bustling Dobuita high street to the sleepy suburbs of Sakuragaoka, Shenmue’s slice of 1980s Japan is one of my favourite videogame settings of all time. And I was glad to see the remaster stick faithfully to the original game’s art style, only boosting the resolution and adding a few tasteful bloom lighting effects. Because despite the relatively simple geometry, the atmosphere of this place is incredible—especially when winter sets in and the snow starts to fall, piling up on the streets, painting the streets white. It’s hard to separate Monster Hunter’s levels from the creatures that live there. When I think of the Coral Highlands the first image that springs to mind is a giant inflating bat. The sacred furry wyvern Paolumu is perfectly at home among the pink coral fronds. As it inflates in self defence, it starts floating around and bumping into things like a panicked bubble. When you track it back to its lair there’s a long convenient vine dangling in the centre of the arena. I dutifully climbed it and secured a jump attack onto the bat’s back for a mean kill. After the dry, dusty deserts of Nevada, New Mexico, and Arizona, Oregon is a breath of fresh mountain air. This expansion for SCS’ latest trucking sim adds the Beaver State to the map, giving you the opportunity to haul heavy cargo through pine forests, mountain trails, and sleepy rural towns. It’s one of the Czech developer’s finest creations to date, showing just how far its world-building has developed over the last few years. You’ve seen New York City in a thousand games before, but what makes Unavowed special is that it makes this familiar setting feel brand new. This is a dark, atmospheric, and uncanny vision of the city, with blood red skies and an otherworldly, unsettling feeling permeating every graffiti-covered street, alleyway, and rattling subway train. It must have insufferable to drive through Edinburgh with me, as one co-op buddy had to when we headed up north in Forza Horizon 4. I don’t get to see many of the places I’ve lived in games, aside from a few with levels set in Dubai, and certainly not facsimiles as detailed as Scotland’s very lovely capital. It’s wild. Every street made me yell and whoop like I’d just seen the most incredible thing. “I used to get stuck in traffic here every day,” I’d shout with delight. It’s not just the big monuments like Edinburgh Castle, whole chunks of the city have been recreated. It was all a bit trippy. Dusk is a trove of excellent and surprising level design, but my favorite might be E3M4: Crypt of the Flash for its total tonal shift. After falling from a great height into a darkened crypt, your flashlight goes out, and chances are you spent almost all your ammo thinning out the crowds of cultists in their underground village from the level prior. With almost no light and a thin arsenal, Crypt of the Flash is a tiny pocket of survival horror in an otherwise swift and violent shooter.